Looking at the weather forecast on Wednesday night didn’t instil much excitement because there would be so little wind that it looked as if we might have a repeat of last week’s single lap Race…but woe to me of little faith, when the volunteers started to rig and launch the Boats at 8am on Thursday morning, there was a steady breeze blowing from the NNE. 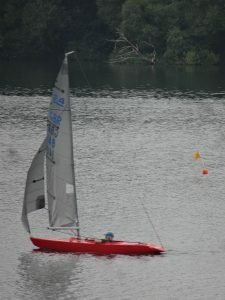 Fortunately these conditions remained until after the Race finished so the eight WS Racers who came down to Chipstead Lake race, were rewarded with an acceptable albeit challenging wind. There were a lot of boats just about on the start line as the final Gong sounded and ….unfortunately those who expected a flyer at the starboard end of the line were hampered by a non-racing dinghy sailing right across their bows…nevertheless, as the pictures below show, the fleet was closely bunched together with groups split, both port and starboard, as they tacked away from the Start Line upwind towards Mark D. Fay Watson and her crew James Thomas got a very good start at the end of the Start LIne in her Access 303 Sail # 9 but she had to tack first to avoid sailing into shallow water and possibly running aground. Meanwhile Peter Gregory in his 2.4m, the Red Torpedo, Sail #148 started higher up the Line, covering Fay, and with his ability to point closer to the wind, he gradually pulled out a small lead by sailing longer than Fay on his initial port tack. Eventually he tacked onto a starboard tack and this forced Martin Newman in his Martin # 126 to tack (And perhaps tacking later than he should have since Peter Gregory was forced to change course to avoid a collision! Ed). Peter Wagner in his 2.4m Sail # 108 had also had an excellent start and was keeping close to the leaders . Mike Blatchford in his 2.4m Sail # 109 was somewhat off the initial pace (A change in strategy from sailing his normal Pink Lady Liberty . Was this due to the light winds? Ed) but was soon able to get to grips with his new mount and started to close in on the front runners. In the light wind Peter G managed to coax the Red Torpedo up to and around the windward Mark D and across the wind to the second buoy of the course Mark J before Martin had rounded Mark D and well before Peter Wagner and Mike Blatchford in their 2.4ms. And as can be seen from these pictures, Peter G was able to start building his lead as he sailed downwind to the third buoy of the course Mark B, waving goodbye to the fighting 2.4ms and Fay’s 303. After all this excitement and with the wind slackening the fleet sailed on its final lap of the race and – as always – even though Peter G was first by a margin on the water he could get no higher than 2nd once his PY handicap had been applied by the clever software we use to calculate the final results, which are shown below. Is there a classification for NFP (No Foot Peddle)? Still, it was a good race! What is this I read…Mr Wagner peddling an idea about an extra PY class for no foot-pedal?? He’ll want something extra for no jib-boom or no bung or no seat or for every other catastrophe that has befallen him during his love affair with the 2.4m dinghy Sail #108!! 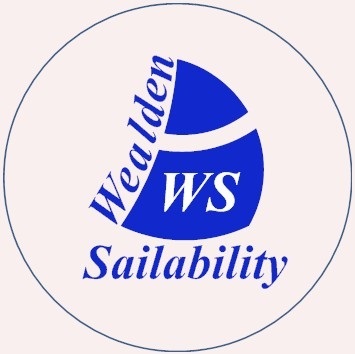 Some just folk want everything – starting with a fully functioning boat….oh well, I’ll have a word with the Trustees (but please do not hold your breath). Keep going Peter!! Haha… not exactly what I was inferring to. I meant with DNF, is there a classification for NFP or NS (No Steering) instead of DNF? I think the problem was that the wood rotted near to the hinge, so as I put some pressure on it, it gave away.